The “Chinese dream” is to own a flat, a car – and, increasingly, a number plate. 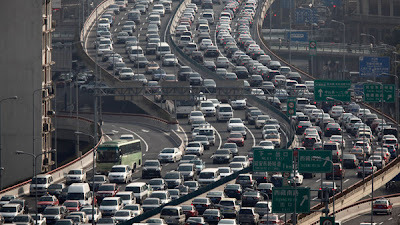 As the world’s biggest car market battles some of the world’s worst traffic congestion and air pollution, licence plate rationing has driven prices up to the point where a Shanghai plate costs nearly three times as much as a cheap Chinese car. Touts throng the entrance of the art deco auction house near Shanghai’s famous Bund, where owners queue up to register for Saturday’s monthly municipal plate auction – Shanghai’s largely unsuccessful effort to control the number of cars on the city’s narrow and chaotic roads. Bank of Shanghai has even set up a desk inside, just in case any of China’s notoriously cash-rich car buyers – who frequently turn up at dealerships with pockets stuffed with renminbi – cannot quite manage the Rmb90,000 ($14,500) likely to be needed to get one of the 9,000 plates in this month’s auction. “The price will just keep rising, so I want to get one as soon as possible,” says Jin Xiaowei, a would-be car owner who says he has no hope of getting a plate unless he uses a middleman to bid for him. Shanghai is trying to crack down on middlemen, who often double as touts, hoarding and reselling plates on the second-hand market. 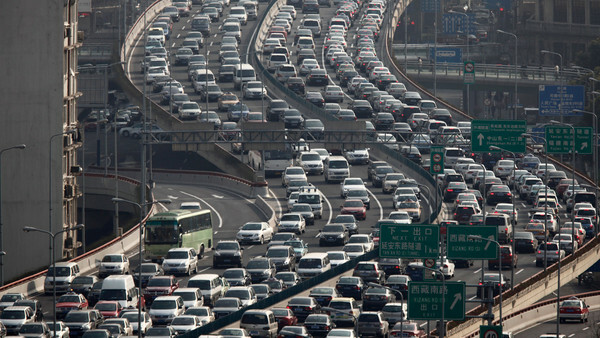 At a time when air pollution and congestion are some of China’s biggest political issues, several cities are considering ways to reduce the number of cars on urban roads, either through congestion fees, auctions or a plate lottery. Beijing offers 20,000 plates a month by lottery – but some residents complain it is easier to win a fortune in the Chinese state lottery than to win the plate lottery. The southern city of Guangzhou is running a one-year trial of a hybrid auction-lottery system, and Guiyang has a limited lottery. Presentation titled "Strategies for Success in China" to be delivered to students and representatives of the EMBA/FEMBA at 8am at the Regent Hotel in Beijing. Volkswagen, one of China’s top two foreign carmakers by sales, is to recall more than 380,000 vehicles after an expose by Chinese state television. The recall, which could prove a blow to one of China’s most popular car brands, aims to resolve a longstanding gearbox problem. The recall comes at a time of growing anxiety in China over product safety, following a series of scandals involving fake or tainted food – including poisoned milk powder. It could also further shake the confidence of Chinese consumers in foreign brands, which have, up until now, been viewed as much safer than domestic products. A recent food quality scandal involving the chicken served at Yum Brands’ KFC restaurants has begun to erode the automatic assumption that foreign brands are always superior, retail analysts say. CCTV, the Chinese state television channel, has recently tried to carve out a niche for itself as a defender of the public interest by conducting investigative reports into sensitive issues such as food safety. Foreign luxury carmakers were targeted by CCTV this month, with a programme that said that the interiors of some premium cars made in China contained harmful chemicals. Daimler, one of the companies pinpointed in the report, said the materials used in the interiors of its Chinese-made cars “comply with all existing regulations worldwide”. “The most important vehicle systems, such as steering and braking, along with other relevant systems will not be affected regarding their functionality,” it added. No deaths or injuries were reported in connection with the problem. Auto market analysts said they did not expect a significant long-term impact on VW sales. “VW has been dealing with gearbox problems for quite some time already, and this has not substantially affected their sales,” says Klaus Paur, global head of automotive for Ipsos consultancy in Shanghai. “But it could grow into a long-term problem if the matter is not solved sometime soon”. Bill Russo, head of Synergistics auto consultancy in Beijing and a former head of Chrysler in China, said: “VW remains in a strong position in China and should recover from this over the longer-term.” But he added that the episode could “help level the playing field as it relates to the foreign and domestic competitors in the Chinese auto market”. Visitors view a Volkswagen Golf automobile as part of the Auto Guangzhou 2009 Exhibition in Guangzhou on Nov. 24, 2009. Volkswagen AG (VOW) recalled a record number of vehicles in China to replace defective gearboxes that may result in the loss of acceleration, in a move that may cost Europe’s largest carmaker more than $600 million. The recall of 384,181 vehicles, conducted by Volkswagen and its joint ventures, include the Golf, Magotan, Sagitar and Audi A3, China’s quality inspector said on its website. While Volkswagen declined to comment on the financial toll, research firm LMC Automotive estimated the replacements will cost between 3,000 yuan ($483) to 10,000 yuan per vehicle. The move is a blow for Volkswagen, which counts China as its biggest market, as the company sets out to become the world’s largest automaker by 2018. The recall comes less than a week after state broadcaster China Central Television featured Volkswagen customers in China complaining about abnormal vibrations, loss of power and sudden acceleration in cars equipped with the company’s proprietary gearbox technology. The company is recalling vehicles with the seven-speed variety of its direct-shift gearboxes, bearing the cost for replacing defective equipment and upgrading the software, it said in an e-mail statement. LMC estimates Volkswagen sold about 680,000 vehicles equipped with the potentially faulty DSG gearboxes. “There have been no injuries or accidents reported due to the DSG gearbox problem, as far as we know,” Volkswagen China spokesman Christoph Ludewig said. The recall covers 21 types of vehicles including versions of the Scirocco, Bora, Touran, Octavia, Passat vehicles produced as far back as 2008 and as recently as this month, according to the state inspector’s statement. For Volkswagen, which sold 4 of China’s top 10 selling cars last year, complaints about its gearbox system in China aren’t new. In May, the Wolfsburg, Germany-based carmaker agreed to extend the warranty for the transmission technology to 10 years, compared with the standard warranty of two years, to address consumer concerns. China’s quality inspector said it began investigating complaints related to faulty Volkswagen gearboxes in March 2012. Two months later, the company extended its warranty for the transmission system after several rounds of talks with the regulator, according to the statement. Volkswagen said today that although an electronic malfunction or a lack of oil pressure may result in a power interruption, steering and braking functions wouldn’t be affected. That means that even if the car loses power on the road, the driver would be able to safely stop the car, it said. China’s quality regulator said it interviewed more than 3,000 consumers, received more than 10,000 reports of faultiness, conducted 12 spot checks and held 7 hearings with automotive experts before concluding that the Volkswagen gearboxes were defective and posed a safety concern. The move also comes after China introduced recall laws this year giving the watchdog broader powers to order investigations and impose fines on companies that fail to call back faulty products in a timely manner. The nation’s legislature approved plans last week to expand the authority of the food and drug regulator amid growing public discontent over quality and safety. Volkswagen and its ventures sold 2.81 million vehicles in China last year, second only to General Motors Co. (GM) among foreign automakers. The German company and its Chinese partners generated operating profit of 3.7 billion euros ($4.8 billion) last year, up by 1.1 billion euros from the previous year. Other German automakers have also faced scrutiny in the past week from CCTV, which said it found asphalt in China-made models of cars made by Volkswagen’s Audi, Bayerische Motoren Werke AG’s BMW and Daimler AG (DAI)’s Mercedes-Benz. Samples taken from vehicles showed traces of asphalt, a road-paving material also used for reducing vibrations, CCTV reported. Owners reported a pungent smell in their cars and physical symptoms such as dizziness and swollen fingers, according to the CCTV report. Representatives from all three companies said they have started investigations. Audi China spokesman Martin Kuehl said Audi has the same “strict standards” for all of its parts globally, while Daimler spokesman Senol Bayrak said all its vehicles manufactured in China use only imported NVH damping materials that comply with existing regulations. The three German luxury brands command about 74 percent of China’s luxury segment, according to estimates from researcher IHS Global Insight. While the report might not significantly affect total luxury car sales, it could push Chinese consumers toward choosing imported models of luxury marques over models manufactured in China, according to John Zeng, Shanghai-based managing director at LMC Automotive. Tata Motors Ltd. (TTMT)’s Jaguar Land Rover and Zhejiang Geely Holding Group Co.’s Volvo Cars may benefit since they focus on imports, he said. “People will choose the import models, because they realize that on quality levels, the import models are very different from locally-made ones,” Zeng said. In most of the world, it takes a lifetime to get rich, if it happens at all. But China’s wealthy get rich on average much more quickly than the affluent of other countries, often well before middle age. In response, luxury car companies increasingly are turning to social media and digital technology – which tend to appeal more to teens than to the bald pate generation – to peddle their wares in what will soon become the world’s largest premium car market. Daimler, the German group, earlier this year became the first carmaker in China to sell cars through the mainland equivalent of Twitter, Sina Weibo. In just over eight hours, 666 special edition lunar new year Smart cars sold out on Weibo, with buyers from as far away as the remote provinces of Gansu and Inner Mongolia snapping up the Rmb128,888 ($20,728) “year of the snake” model. Around the same time Audi, known in China as the brand for bureaucrats, made an effort to freshen up its stodgy image by opening an interactive digital showroom in a Beijing shopping mall. The German company says its floor-to-ceiling projection walls can showcase hundreds of millions of different bespoke vehicle combinations to please even those for whom owning an Audi is at the moment no more than a “pipe dream”. “Some 80 per cent of high net worth individuals in China are 44 or younger, compared to the US where it is only 30 per cent and Japan only 20 per cent. And younger people tend to be more internet savvy,” says Bill Russo, head of Synergistics auto consultancy in Beijing and former head of Chrysler in China. Until recently, luxury carmakers could count on growth rates in China that could hardly be matched elsewhere – an average of 36 per cent a year over the past decade. But that sales growth has slowed and competition has intensified as foreign and domestic carmakers try to grab market share in this most profitable segment of the Chinese car market, auto analysts say. Appealing to customers means reaching out to them where they like to shop: online, says Klaus Paur, global head of automotive at Ipsos consultancy in Shanghai. “Ninety-five per cent of people who go to a dealership in China have already visited the company’s website and know exactly what they want,” he says. The need for digital marketing will continue to grow as the Chinese premium car market expands beyond the current 100 cities, to 300 cities by 2020, says Sha Sha, automotive expert at McKinsey. The consultancy recently predicted that China will surpass the US as the world’s largest premium auto market in just three years. McKinsey forecasts 12 per cent growth in the Chinese premium car market through 2020, compared with 8 per cent for the overall Chinese passenger vehicle market. And one BMW viral marketing campaign in 2011 generated criticism online for tricking the Chinese media into running news stories about the appearance of crop circles in the Gobi desert – which later turned out to be faked by BMW to generate buzz around the launch of their new entry-level 1 series cars in China. One user on Weibo commented: “The loss outweighed the gain: the product gained publicity, but lost its reputation”. But Liu Yiwei, E-marketing manager at BMW China, defends the campaign, saying BMW likes to “try on fresh ideas” and adding that the campaign was designed to appeal to “young and energetic people who cling to the internet and believe in individualism in China”. BMW’s marketing slogan for the new 1 series was “unique for one” – or UFO. Meanwhile, Chinese carmakers are all racing to move upmarket into the premium segment, 80 per cent of which is controlled by the big three German automakers – BMW, Audi and Mercedes. But most analysts think a Chinese brand will struggle to break into the top tier: “Chinese companies are likely to deliver luxury products long before Chinese consumers will ever consider them luxury products,” says Mr Russo.